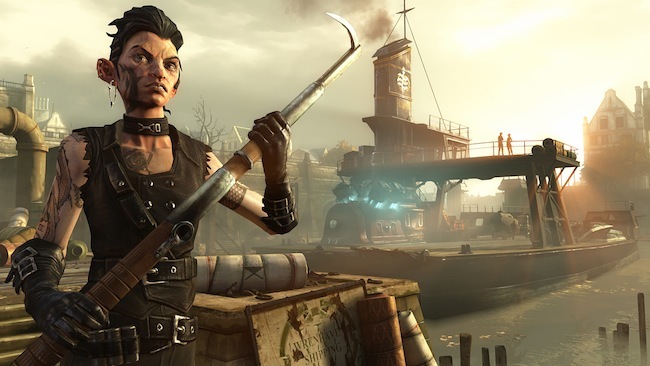 The third DLC for Arkane Studios’ 2012 surprise hit Dishonored, The Brigmore Witches, will release Aug. 13. The story add-on will drop on PlayStation Network and PC for $9.99 and Xbox Live for 800 Microsoft Points. Publisher Bethesda teased the DLC on Monday with concept art before the full reveal today; the second story DLC will focus on assassin Daud, one of the major antagonists of Dishonored’s main plot and the star of the first story add-on, The Knife of Dunwall. The plot of The Brigmore Witches follows from The Knife of Dunwall (some spoilers follow): Daud has tracked down the head of the Brigmore witch coven and must stop her from carrying out a ritual that will end his existence. As Daud travels through the districts of Dunwall, he must work the city’s various gangs. Advertised on Twitter with the tagline “Daud’s journey concludes,” the assassin will have to answer for his crimes, including his murder of the empress, which set off the entire plot of Dishonored in the first place. Save files from The Knife of Dunwall will carry over progress – various character upgrades, Chaos level and actions – into The Brigmore Witches. As previously reported, the content will be playable at QuakeCon 2013, which runs from Aug. 1-4.